Crescent shaped cluster earrings with cabochon stones of amethyst; tourmaline and blue topaz. The colors are well combined to create a beautiful, soft palette. Clip backs can be converted to posts. The earrings measure 1 inch in length and 3/4 inch in width. Stella Rubin has been buying and selling antiques for nearly 40 years. The authenticity of all items is guaranteed. 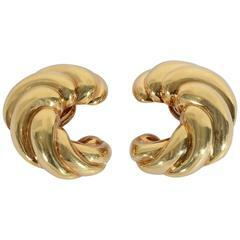 Eighteen karat gold, large crescent shaped earrings with an overall swirled design. The backs are clips that can be changed to posts. The earrings measure 1 1/4" long and 1" wide. 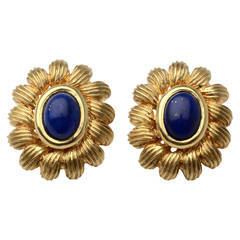 Dome shaped earrings by Tiffany in which bands of 18 karat gold alternate with bands of blue and white enamel. They are 3/4 inch in diameter. Clip backs can be converted to posts. Bold and striking 18 karat gold earrings by Barry Kieselstein Cord. They are abstracted, lobed hearts. Backs are clips that can be converted to posts. 18 Karat yellow gold, Diamonds, Garnets, Citrine,Peridots, Amethysts and Blue Topaz Earrings. Omega back clips. Beautiful Angel-Skin Coral Cabochon Earrings surrounded by Diamonds, approx. 0.8 ct., 18 kt Whitegold, with removable Pampels. The earrings are made in 18kt yellow gold they feature round rutilated quartz and are finished with clip-backs.